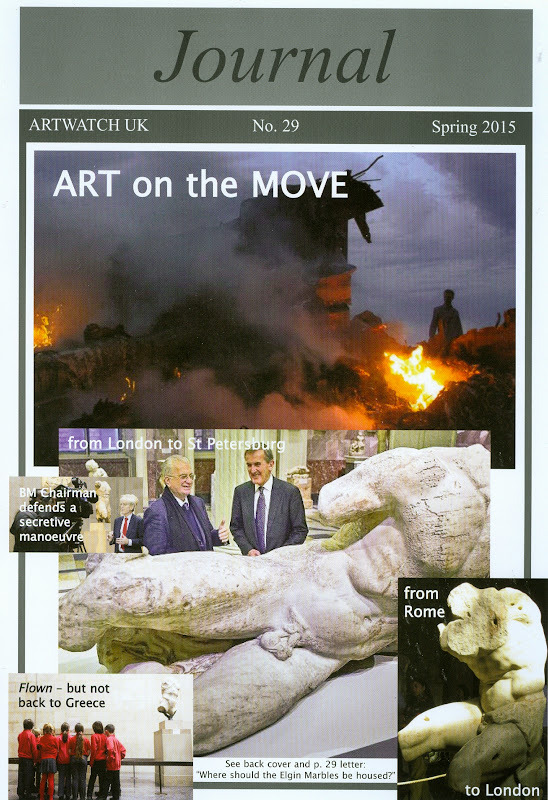 The forthcoming ArtWatch UK members’* Journal examines restoration problems; betrayals of trust; the role of conservators in the illicit trade in antiquities; and, the escalating commercial scramble by museums that is disrupting collections and putting much of the world’s greatest art at needless risk. Museums once provided havens for art and solace to visitors. They were cherished for their distinctive historically-given holdings and their staffs were answerable to trustees. Today they serve as platforms for conservators to strut their invasive stuff and as springboards for directors wishing to play impresario, broadcaster or global ambassador. Collections that constituted institutional raisons d’être, are now swappable, disrupt-able value-harvesting feasts. Trustees are reduced to helpmeet enablers of directorial “visions”. No longer content to hold display and study, museums crave growth, action, crowds and corporately branded income-generation. For works of art, actions spell danger as directors compete to beg, bribe and cajole so as to borrow and swap great art for transient but lucrative “dream” compilations. Today, even architecturally integral medieval glass and gilded bronze Renaissance door panels get shuttled around the international museum loans circus. 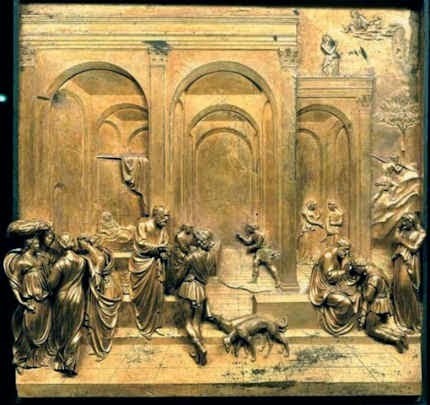 Above, top, one of Ghiberti’s Florence Baptistery doors (which were dubbed “The Gates of Paradise” by Michelangelo) during restoration. 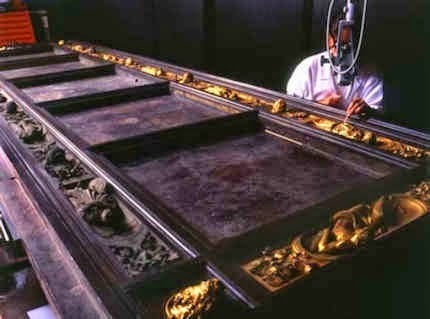 Above, one of three (of the ten) gilded panels from the doors that were sent from Florence to Atlanta; from Atlanta to Chicago; from Chicago to the Metropolitan Museum, New York; from New York to Seattle; and, finally, from Seattle back to Florence. To reduce the risk of losing all three panels during this marathon of flights, they were flown on separate airplanes. In such an art-churning milieu this organisation’s campaigning becomes more urgent. Fortunately, our website (http://artwatch.org.uk/) has increased our following fifty-fold – and see, for example: “How the Metropolitan Museum of Art gets hold of the worlds most precious and vulnerable treasures”. Here, we publish an abridged version of the fifth lecture given in commemoration of ArtWatch International’s founder, Professor James Beck, and examine persisting betrayals of trust, errors of judgement and historical reading, problematic “conservations”, and questionable museum conservation treatments of demonstrably looted antiquities. For these we warmly thank Martin Eidelberg, Alec Samuels, Alexander Adams, Einav Zamir, Selby Whittingham and Peter Cannon-Brookes. We commend two books, one for its freshness of voice, the other for a pioneering combination of high-quality images and scholarly texts in coordinated print and online productions. We also reproduce our online archive and related letters to the press. Last July the outgoing chairman of the British Museum’s board, Niall Fitzgerald, disclosed in the Financial Times that because the director, Neil MacGregor, “obviously isn’t going to stay for ever” it was right that a new chairman [in the event a long-standing BM trustee and former editor of the Financial Times, Sir Richard Lambert] should lead the search for his successor. 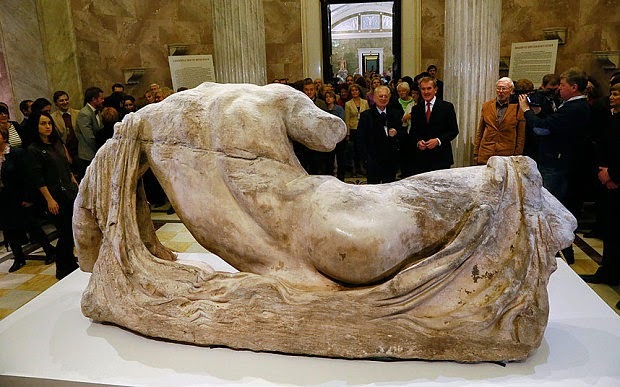 In December – and with levels of secrecy that would have thrilled his one-time mentor at the Courtauld Institute, Anthony Blunt – MacGregor dispatched one of the most important free-standing Parthenon sculptures, the carving of the river god Ilissos, to the Hermitage Museum in St. Petersburg. In lending Ilissos to St Petersburg just months after Russian troops had annexed part of Europe and Russian-armed separatists in Eastern Ukraine had brought down a Malaysian Airlines Boeing with a loss of 298 lives including around 100 children (see cover), the British Museum conferred an institutional vote of confidence in Putin’s Russia at a time when the West has mounted economic sanctions against his incursion and his continuing de-stabilisation of Eastern Europe. Moreover – and in a gratuitously provocative manner – by subjecting one of its most precious and controversially held works to needless and inherent risks, the British Museum presented its institutional a*** to everyone in Greece who is seeking to re-unite all of the surviving Parthenon carvings. On 9 December 2014 we protested in a letter to the Times (“Where should the Elgin Marbles be housed?” – see p. 29) that the action had gravely weakened the case for the British Museum retaining its controversially held “Elgin Marbles” and that it constituted a failure of imagination and a dereliction of duty on the part of the museum’s trustees. Above, the carved figure of Ilissos, as displayed (top) at the British Museum, in the context of the surviving group of free-standing figures from the West pediment of the Parthenon; and, (centre and above) as displayed when on loan to the Hermitage Museum, St. Petersburg. 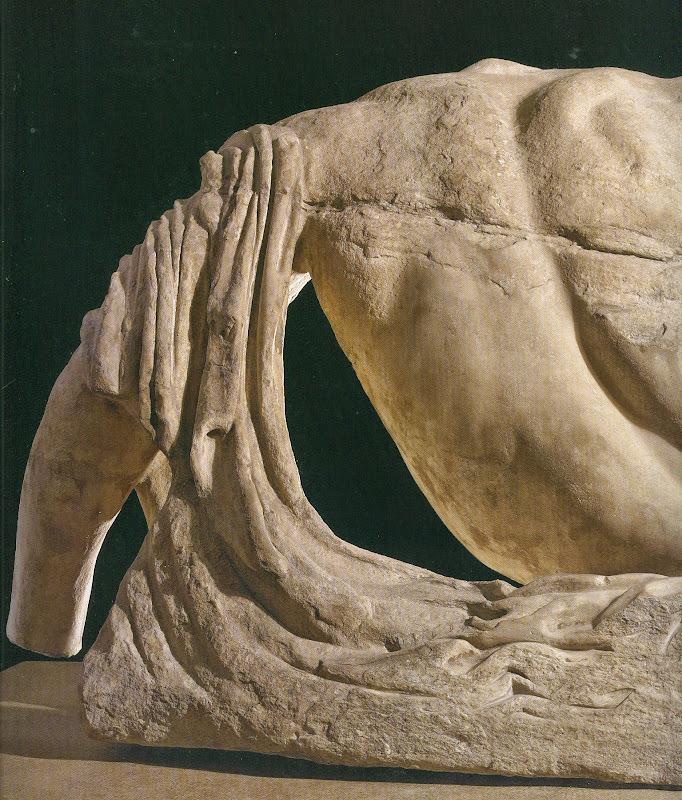 Above, details of the back of Ilissos, (as photographed by Ivor Kerslake and Dudley Hubbard for the 2007 British Museum book, “The Parthenon Sculptures in the British Museum”, by Ian Jenkins, a senior curator at the museum) showing the faultline in the stone that runs through the entire figure. 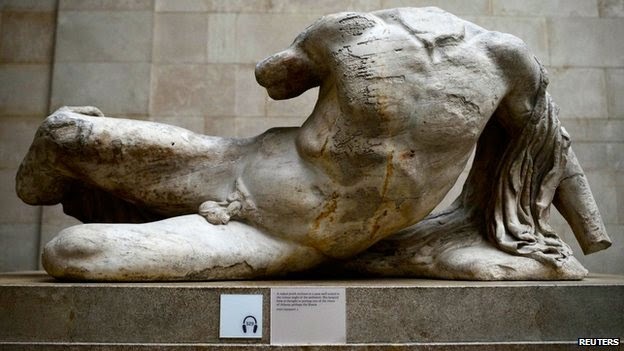 Perhaps the provocative loan was a piqued riposte to Mr and Mrs George Clooney’s attempts to have the British Museum’s Parthenon sculptures returned to Athens? Or, perhaps, simply a flaunting confirmation that nothing within the museum’s walls is now considered sacrosanct. In any event, 5,000 objects were put at risk (see below) last year in pursuit of MacGregor’s desire to transform the great “encyclopaedic” museum into a glorified lending library – or, as he puts it, into “a universal institution with global outreach”. The loan to Russia breached a two centuries old honouring of the original terms of purchase which required the Parthenon carvings collection to be kept intact. We now learn that those sculptures are to be further denuded with three more loan requests under consideration. 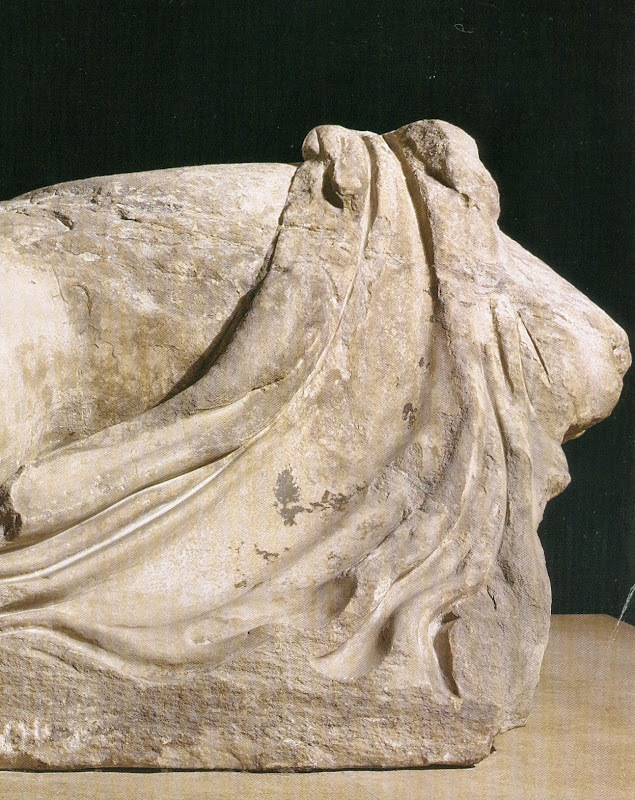 We have supported the British Museum’s retention of the Elgin Marbles for over a decade, in print and in debates in New York, Athens and Brussels. (See Journals 19, 20, 25 and 26.) A key consideration was the relative safety of the sculptures in London and Athens. 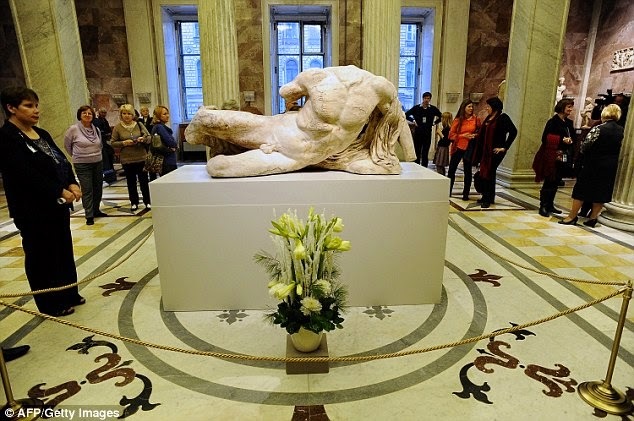 This latest policy reversal tips that balance in favour of Athens and thereby blows the moral case for the retention of the sculptures in London. It makes it impossible for us to maintain our previous support. Such was the secrecy of this operation that the British Government was informed of it only hours before the story broke in a world-exclusive newspaper report. Under its new chairman the museum’s board proved supine, authorising the manoeuvre despite its own concerns over the sculpture’s safety. Officially, the museum betrays an almost delusional insouciance on the inherent risks when fork-lifting, packing, fork-lifting, lorrying, fork-lifting, flying, fork-lifting, lorrying, fork-lifting, unpacking – twice-over – an irreplaceable world monument on a single loan. Art handling insurers testify that works are at between six and ten times greater risk when travelling. Against this actuarial reality, the museum’s registrar variously boasted that “museums are good at mitigating risk”; that the loan had needed undisclosed insurance; and that, if intercepted by thieves, “they would be unable to sell it”. The source of this institutional confidence is unclear. As we reported in 2007 (Journal 22, p.7), in 2006 the British Museum packed 251 Assyrian objects – including its entire collection of Nimrud Palace alabaster reliefs and sent them in two cargo jets to Shanghai, with stop-overs in Azerbaijan, thus subjecting the fragile sculptures to four landings and take-offs. On arrival in Shanghai the recipient museum’s low doorways and inadequate lifts required the crated sculptures to be “rolled in through the front door”. Three crates remained too large and had to be unpacked “to get a bit more clearance”. One carving was altogether too tall and “we had to lay him down on his side” to get him in, the British Museum’s senior art handler said. It was then found that the museum’s forklift truck was unsafe (and needed to be replaced), and, that “a few little conservation things had to be done”. When the resulting quid pro quo loan of Chinese terracotta figures was sent to the British Museum the following year, two dozen wooden crates were held for two days at Beijing airport because they were too big to enter the holds of the two cargo planes that had been chartered. When the crated sculptures arrived at the British Museum, they were also found to be too big to pass through the door of the Reading Room (from which Paul Hamlyn’s gifted library had been evicted – then temporarily, now permanently). The door frame was removed but three cases were still too big. These had to be unpacked outside the temporary exhibition space in the Great Court. The “temporary” misuse of the Reading Room became a permanent fixture until the new £135m (on a £70-100m estimate) exhibition and conservation centre in the antiseptic style of a Grimsby frozen food factory was opened last year (see back cover). Having insultingly evicted the Paul Hamlyn art library, it is now being said that the Reading Room “lacks a purpose” and that Mr MacGregor is musing on possible alternative uses to … reading books in a fabulous library previously occupied by national and international literary and political luminaries. One of these alternatives would be to raid the museum’s own diverse and encyclopaedic sculpture collections so as to tell a singular, MacGregoresque multi-cultural world story. Were he to be indulged in this (English Heritage witters alarmingly that the Reading Room’s Grade 1 listing does not necessarily preclude changes of uses), the director would leave a monument to himself achieved by subverting the historically-resonant, listed purpose made classical building in order to patronise and spoon-feed future visitors who might better have made their own judgements on the relative merits of the artefacts held in the museum’s various assembled civilisations. If the present lending policies are not curtailed a further monument to MacGregor’s reign will be found in the art handling facilities of the new “improbably large” conservation and exhibitions centre. These are such that a crated elephant would now “arrive elegantly, the right way up”. What – surprisingly – did not arrive was the exhibition of treasures from the Burrell Collection that is being sent on a fund-raising world tour. This tour was made possible by the overturning in the Scottish Parliament of the terms of Burrell’s bequest which prohibited foreign loans. The overturning was made with the direct support and participation of Neil MacGregor and the British Museum was to have been the tour’s first stop. (Only three voices against the overturning were heard in the Scottish parliamentary proceedings: our own; the Wallace Collection’s academic and collections director, Jeremy Warren; and, the National Gallery’s director, Nicholas Penny, who attacked the “deplorable tendency” for museum staffs to deny the grave risks that are run when works of art are transported around the world.) As we reported online (“A Poor Day of Remembrance for Burrell”, 11 November 2013, Item: MR MACGREGOR’S NO-SHOW AT THE SCOTTISH PARLIAMENT HEARINGS), after a reproach in the Scottish Parliament, Mr MacGregor replied: “It was suggested by the Convener on 9th September (column 33) that as the British Museum might be involved in helping organise the logistics of a possible loan, and as works from the Burrell Collection might be shown at the British Museum, I might find myself in a position of conflict of interest. I think I can assure the Convenor that this is not so. The British Museum would not profit financially from either aspect of such co-operation with our Glasgow colleagues…” In the event, the first stop of the world tour was at Bonhams, the auctioneers, not the British Museum. Michael Daley. 1 March 2015.